Pete Rademacher (born 1929) is a former boxer who made boxing history in an most unconventional way. 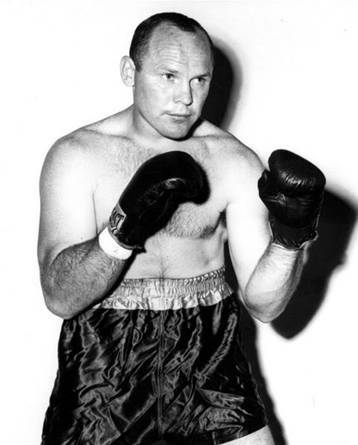 After winning the gold medal at the 1956 Olympics in the Light Heavyweight division, Rademacher started saying that he would be able to become world Heavyweight champion in his first professional fight. He made his belief public and was able to lure world Heavyweight champion Floyd Patterson into defending his crown against the debutant Rademacher. Rademacher quickly became a mainstream celebrity, being the subject of television talk show talk, and of much gossip around boxing magazines, fans and critics. It was the first time that a fighter making his professional debut challenges for a world crown, and it remains the first time a debutant fights for the world Heavyweight title. Rademacher dropped Patterson in round two, but Patterson recovered and defeated him by a knockout in six. Rademacher later on went on to fight people like future Muhammad Ali challenger Zora Folley, Brian London, George Chuvalo, Lamar Parks and the former world Light Heavyweight champion, Archie Moore. He lost to Moore, Folley and London but beat Chuvalo and Parks. He had mixed success during the rest of his career, winning about 66 percent of his bouts, but he was never able to achieve the boxing goals he had set for himself, and eventually he retired with a record of 15 wins, 7 losses and 1 draw, with 8 wins by knockout. After retirement, he went into business, and once, after a fight by Patterson in Rademacher’s hometown, Patterson and Rademacher had lunch and Patterson asked about a job on the place Rademacher worked at. After Rademacher gave Patterson a spot on the company’s training roster, Patterson quit, because he did not want to relocate his family to Boston, a requisite during the company training period. Rademacher was named, in 1989, President of a division in the company he worked for. In 1996, he and his two daughters helped carry the Olympic torch around the streets of Cleveland, Ohio.